Now that the cold weather is coming, it’s time to put up bird feeders and wait for the daily entertainment. Yes, for me watching the little guys come and go is fascinating and fun. It’s easy and cheap to attract birds to your yard, which makes it even better. Feeders and poles to put them on can be built or bought and seed isn’t awfully expensive. All that’s left is finding the time to sit and watch. Much preferable to daytime TV! A great resource is Clive Dobson’s Feeding Wild Birds in Winter. It starts you off with “A Simple Program” for feeding birds. Other sections are on the winter birds, food, feeders, and creating a natural habitat for birds. There are suggestions for very inexpensive feeders you can make from things you may have already in your home. In order to attract a variety of birds, you’ll need to put out various foods. One of them is suet cakes. These can get pricey so I decided to make them myself – how hard could it be? Imagine my surprise when the butcher gave me as much fresh suet as I wanted for free! Not wanting to overdo it on my first try, I asked for a about 1kg/2.5lb. Happy with my discovery, I headed home and put the pieces of suet in a saucepan to render. To render suet for suet cakes, cook it on medium-low heat until it is reduced to clear liquid and the crunchy brown bits our grandparents called “cracklings”. About a kilo/2.5 pounds of raw suet rendered down to about a cup in a couple of hours. You need to know that suet stays soft after heating only once so, after straining out the cracklings, I left the whole pot out in the veranda over night to cool, then reheated it the next day. You can use anything that is heatproof to mould suet cakes. For the cage feeder I used an eight-inch cake pan for a slab to cut into four-inch square cakes. There were stale ice-cream cones in the cupboard that would be fun dropped into the cage feeder. Some silicone muffin cups would hold small amounts of the mixture to be softened and packed into a suet log. Aside from suet, the other ingredients I had were millet left over from last winter, and some stale oatmeal and sesame seeds. 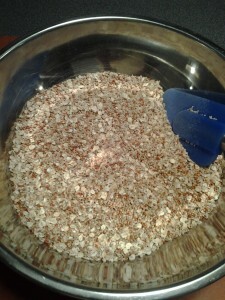 You can add sunflower seeds, dried fruit, chopped peanuts or store-bought birdseed. Place the suet on low heat until melted. Place the grain and seeds in a large heatproof bowl. Set out the moulds near a heatproof surface. 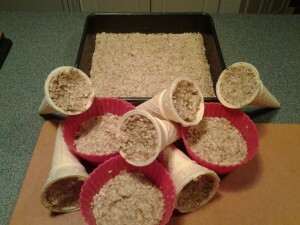 Line any large moulds with waxed or dampened parchment paper to ease release of the finished suet cake. Raise the heat under the suet to medium and add the peanut butter. 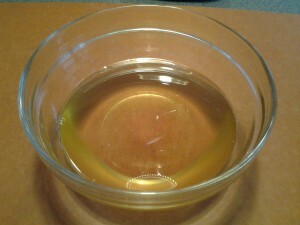 When the mixture is smooth and hot, pour it over the dry ingredients. Quickly combine the wet and dry ingredients and immediately fill the moulds. Place the moulds in the refrigerator, or in a cold room protected from marauding varmints. Allow the suet to cool in the moulds overnight. Remove the suet cakes from the moulds. Wrap and freeze if not used immediately. On my first try, I used only one cup of suet. 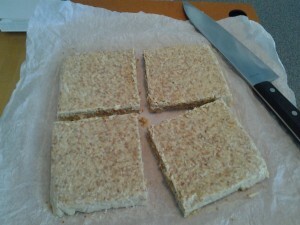 I tested the slab after a few minutes and found that it was too crumbly to cut into cakes. So, I melted the crumbly stuff from the cake pan and muffin cups, mixed in the other cup of suet and put it back in the moulds. After that the slab stayed together and was easy to cut with a large chef’s knife. The suet cakes were ready to put in the freezer until needed in the cage feeder. Hopefully, over the winter I’ll get someone to take some decent photos of birds eating the suet cakes from the cage feeder and perching on the suet log. Do you provide winter food or shelter for birds or other animals? Leave your tips and techniques for the Blend! Great recipe Janet, I’ll definitely try this. If you aren’t feeling so industrious, check out the Wild Bird Unlimited Nature Shop on Bank Street in Ottawa. It’s excellent! Yes, their client club offers some great deals, too.